O.B. 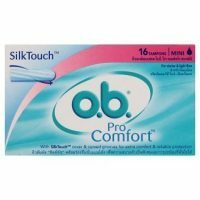 Pro Comfort Mini - Tampons - few packets. I have few packet O.B. Pro Comfort Mini - Tampons for SALE - I bring them from German. 1 packet - 55 LE. This Ad has been viewed 323 times and got 1 reply.